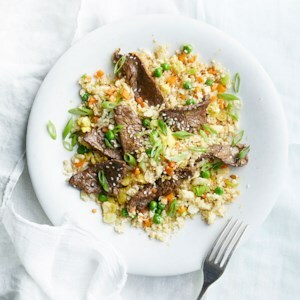 Find healthy, delicious beef stir fry recipes, from the food and nutrition experts at EatingWell. 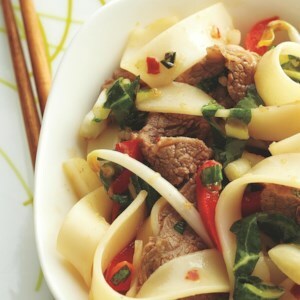 Noodles are a key part of Chinese New Year celebrations because they symbolize long life. We love this recipe for the tradition because it's super-customizable based on your tastes. Try swapping in chicken for the steak. Can't find Chinese broccoli? 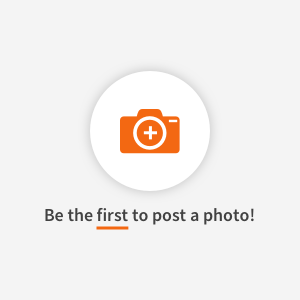 Use broccolini instead. 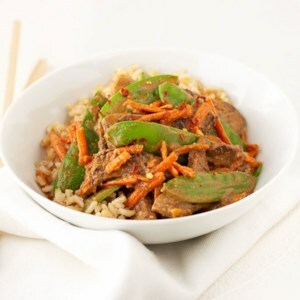 Or swap out the mushrooms and broccoli altogether for snow peas and carrots. 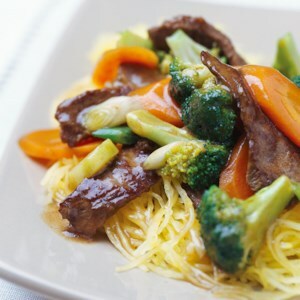 This Asian-inspired beef stir-fry recipe is loaded with crisp-tender vegetables and served over spaghetti with a sweet orange-teriyaki sauce. If you don't have spaghetti noodles in your pantry, substitute soba noodles, rice or quinoa. 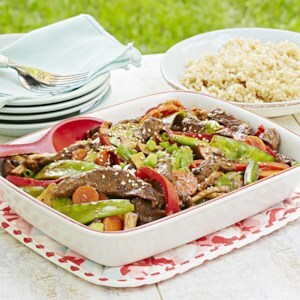 Sesame seeds and sesame oil give this beef and fruit stir-fry a double dose of nutty flavor. Served over brown rice, this quick dinner can be on the table in under 30 minutes. Beef and broccoli is always a pleasing dinner combination. When you stir-fry the two and combine them with salad greens and a ready-made ginger vinaigrette, you'll have a Asian-inspired, main-dish salad in just 20 minutes. Want a complete meal on the table in just 35 minutes? 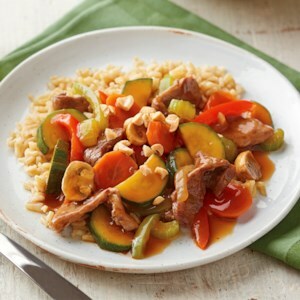 This stir-fry combines thin strips of sirloin, loads of vegetables and brown rice in a tasty soy and sherry sauce. It's a meal the whole family will love. 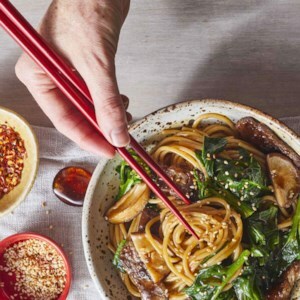 It's tempting to order take-out but not necessary when you can make this delicious stir-fry at home in just 40 minutes. 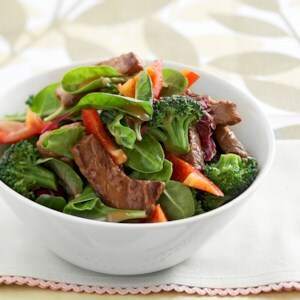 Thinly sliced sirloin and mixed vegetables are cooked quickly in a hot skillet and then combined with a heavenly citrus-soy sauce. Served over brown rice, this is a dish your whole family will love! This easy stir-fry is a great healthy dinner for one. Make it your own by choosing between beef and chicken. Vegetarian? Skip the meat altogether, or sub in tofu. 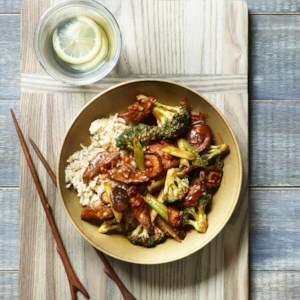 Sure to be a crowd-pleaser, this Asian-inspired dinner is full of flavor and a healthier option than take-out. 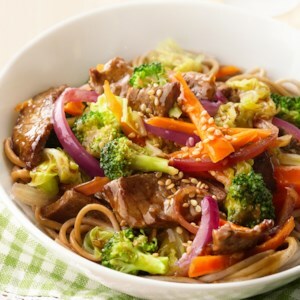 Tender beef top sirloin and broccoli in an Asian-inspired sauce is served over noodles for the taste of takeout from your own kitchen. 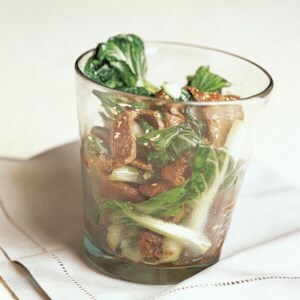 Reduced-sodium soy sauce and beef broth limit the sodium in this stir-fry, keeping it healthy and fresh-tasting. 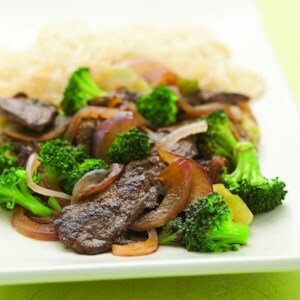 This quick stir-fry features broccoli and flank steak in a flavorful sauce. 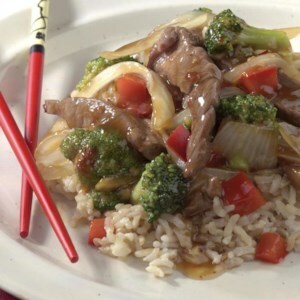 This dish is typical of many traditional Chinese stir-fries--the sauce just clings to the beef and vegetables but is not enough to spoon over rice. Marinating beef is essential for ensuring the meat is flavorful. The meat does not marinate overnight, as in traditional Western recipes. The moment the beef is combined with the seasonings it is ready to be stir-fried. Orange marmalade is the secret ingredient in this quick stir-fry. 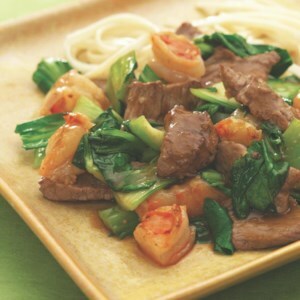 For variations, substitute chicken, shrimp, pork or tofu for the beef; adjusting the cooking time accordingly. 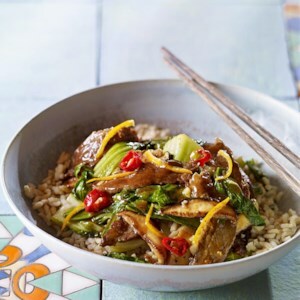 Oyster sauce and rice wine give this speedy stir-fry a rich flavor that balances the clean, sweet crunch of bok choy. Make It a Meal: Rice noodles or brown basmati rice and a Tsing Tao beer will make you feel like you're eating in your favorite Chinese restaurant. Hints of orange and a touch of heat dress up a classic combination. Serve with rice. 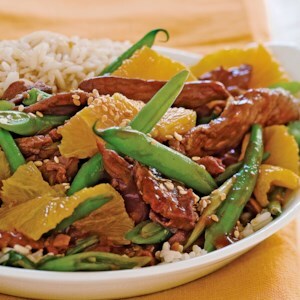 Tangerine juice and savory oyster sauce are the foundation of the stir-fry sauce in this healthy recipe for Chinese orange beef. 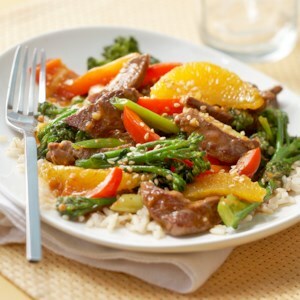 Don't skip the orange zest sprinkled over the stir-fry at the end--it delivers the biggest flavor punch. Serve over brown rice or quinoa. 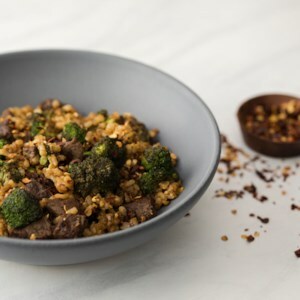 This healthy beef and broccoli stir-fry recipe has a Korean-inspired gochujang sauce. Because stir-fries cook up quickly, have all the ingredients prepped and next to the stove before you turn on the heat. 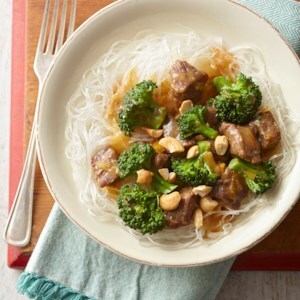 Serve over brown rice or rice noodles.